Iro "Canyon" mini dress features a combo-illusion in sheer and opaque printed chiffon. 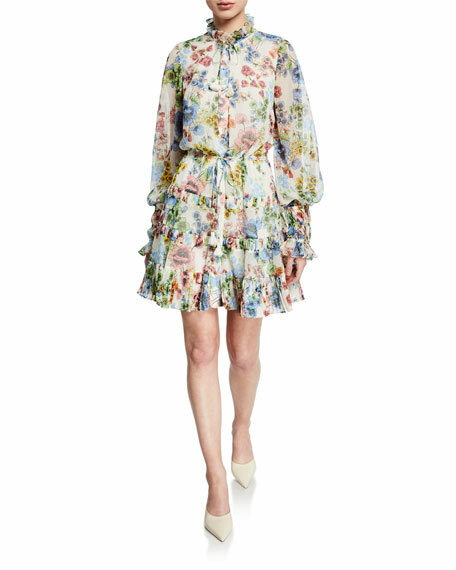 Alexis "Jaila" dress in floral-print with ruffle trim. Ruffled stand collar; button front. Long sleeves; smocked cuffs. Tasseled self-ties at waist. Tiered A-line silhouette. Flounce hem. Mini length. Polyester; self lining. Imported. 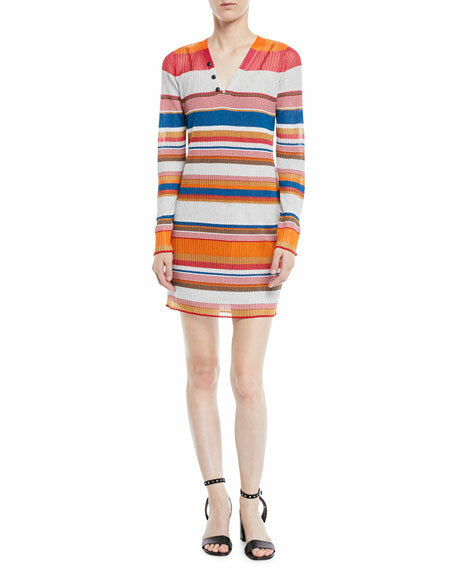 Rag & Bone "Katie" dress in metallic stripe ribbed knit. V neckline; button details. Long sleeves. A-line silhouette. Mini length. Slipover style. Viscose/metallic fiber/polyester. Lining, viscose/polyester. Imported. Rhode Resort "Ella" dress in enlarged paisley print cotton poplin. Crew neckline. Long sleeves. Braided belt at waist. A-line silhouette. Mini length. Cotton. Dry clean. Imported.